GoldSeal OptimaTM CT540 is ready when you are. 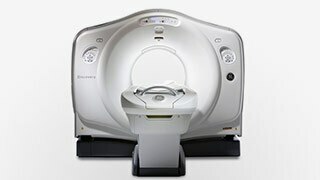 The new Optima CT540 optimizes the patient experience while continuing to provide exquisite image quality. It answers your need for exceptional clinical results with an increased volume of patient throughput and a focus on patient-centered tasks. HiLight Matrix Detector with 24 reference elements and 0.5-sec rotation speed. ASiR1 to help you achieve your lower dose needs. Volara Digital DAS with an increased sampling rate of up to 20% and electronic noise reduction up to 33%. Speed with IQE—70 cm chest-abdomen-pelvis in 10 seconds. Boost your pitch and cover more anatomy at the same image quality. The short geometry design of the Optima CT540 system enables equivalent imaging flux compared to a system with a longer geometry and higher generator power. 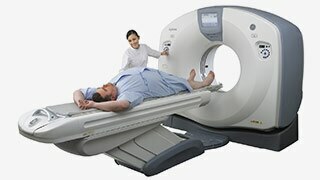 Ultra compact form - maintains the optimal speed, power and resolution needed for all kinds of CT applications. Yet it fits in the same space as a single slice for an easier installation. Freedom Workspace offers sit/stand and horizontal/vertical monitor flexibility. It can also help reduce noise and heat with remote location of the console. 1. In clinical practice, the use of ASiRTM may reduce CT patient dose depending on the clinical task, patient size, anatomical location, and clinical practice. A consultation with a radiologist and a physicist should be made to determine the appropriate dose to obtain diagnostic image quality for the particular clinical task. Xtream Display with on-gantry display for patient name recognition and exam type. Default Patient Positioning provides easy and simple positioning. Dynamic Transition SmartPrep allows intermittent monitoring of IV contrast enhancement in an area of interest. Emergency Patient Mode has a dedicated User Interface (UIF) for emergency cases to start examinations quickly. Prospective Multiple Reconstruction (PMR) allows up to 10 sets of reconstructions to be pre-programmed as part of the scan protocol prior to acquisition. Enhanced filming workflow tool provides a friendly and powerful user interface. Allows you to open multiple sessions at the same time for one or more patients and to set up multiple films in parallel. The GoldSeal DiscoveryTM CT750 HD is a refurbished head and whole body high definition CT system featuring innovative radiation-dose-reducing ASiR technology.